Eggplant completes the trio of summer vegetables that began with tomatoes and peppers. It has a smoky, creamy flavor that mixes perfectly with the spicy sweetness of peppers and the acid sweetness of tomatoes to become caponata, the stew of eggplant, peppers and tomatoes, along with some onion, garlic and fresh basil, that signals high summer to me. I make it as often as I can this time of year. I use the recipe in Nancy Harmon Jenkins’ Flavors of Tuscany (1998). I especially like the cooking sequence she suggests: sauté the eggplant first until it is browned then remove it from the skillet; sauté the peppers, onions and garlic until they are soft; return the eggplant to the pan and add several peeled, chopped tomatoes and cook at a fairly high heat until the tomatoes have broken down and formed a thick sauce that coats the other ingredients. I serve it at room temperature with slivered fresh basil stirred in. The proportions for one batch are a pound of eggplant, two large sweet bell peppers, one medium onion and one garlic clove, three very ripe tomatoes and a handful of basil. I often make a double batch. 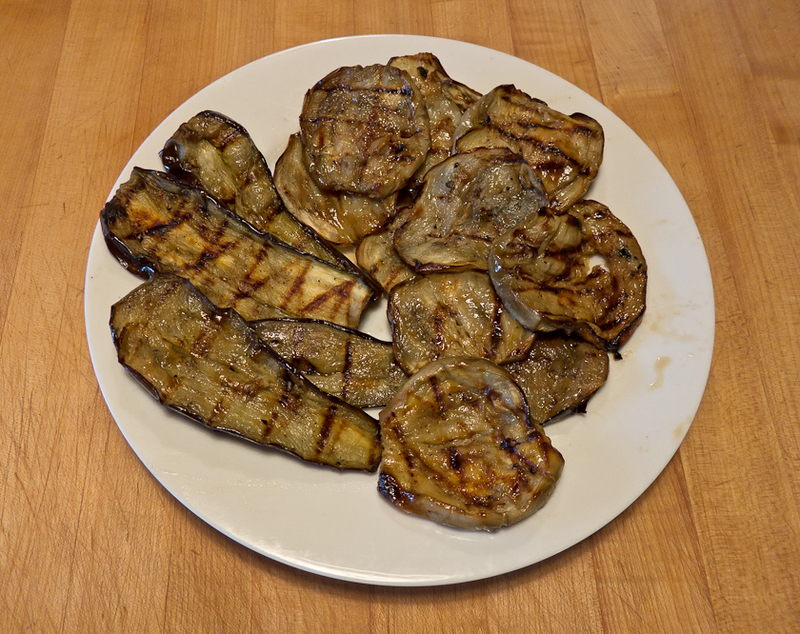 But eggplant alone is delicious too, sliced and grilled and slipped between pieces of bread for a sandwich or scattered on pizza dough with garlic and fresh mozzarella or tossed on pasta with some goat cheese and a few dried tomatoes. Jack Bishop’s Pasta & Verdura, 140 Vegetable Sauces for Spaghetti,Fusilli, Rigatoni, and All Other Noodles (1996) is the source for the grilled eggplant, dried tomato and goat cheese pasta sauce. My friend Heleen and I started making this sauce years ago and it’s still a favorite. Alice Water’s Chez Panisse Pasta, Pizza & Calzone (1984) is the source for the eggplant pizza topping, so simple yet a perfect showcase for grilled eggplant. It’s a favorite of my friend Kathy. Bishop’s book is out of print but a Google search suggests that many copies are still available from different sources. It’s an inspiring book and worth tracking down. Water’s wonderful book is still in print and like Bishop’s has many suggestions for using eggplant. 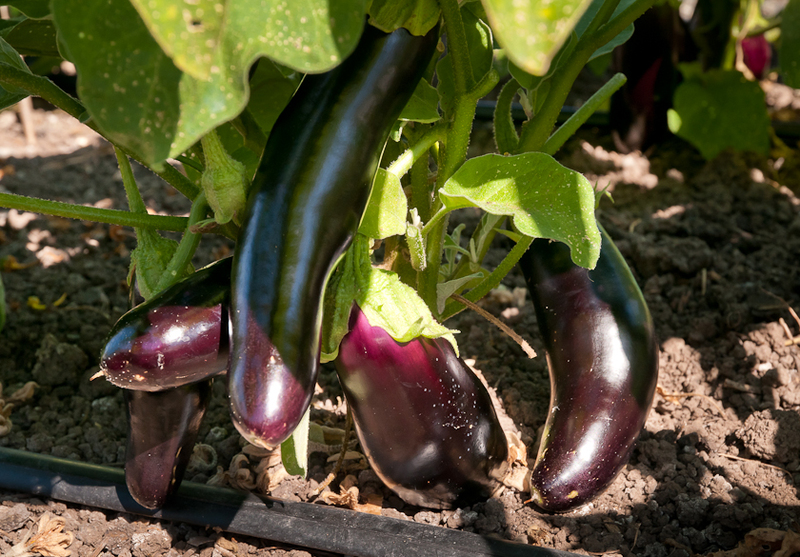 Growing eggplant poses the same challenge that tomatoes and peppers do in our cool climate: providing extra heat with a cloche or greenhouse. I start seeds indoors in mid-March, the same time I start peppers, set plants out in a cloche or greenhouse in mid-May and start harvesting eggplant in early August. This year, as I have for the past several years, I grew Diamond, Rosita and Rosa Bianca, a purple, a mostly lavender and a mostly white eggplant, all from Fedco seeds and all productive this year despite the cool temperatures. Many cookbook writers bring up the issue of bitterness and recommend salting the eggplants before cooking to remove it. Other cookbook writers say that fresh, just-picked eggplants won’t be bitter, and that’s been my experience, mostly. But, because I’ve read that cool temperatures and irregular watering can contribute to bitterness, I taste a thin slice of each eggplant before cooking with it just to be sure there’s no bitterness. If I taste any bitterness, I’ll salt it by sprinkling either slices or chunks with salt, letting it sit for an hour, then rinsing quickly and pressing dry with a towel before sautéing or grilling. While I have good methods for preserving tomatoes and peppers for winter eating, I haven’t come up with a good way to carry eggplant into another season. Maybe that’s what makes eggplant an even more special summer treat. This entry was posted in Summer Vegetables and tagged Caponata, Diamond Eggplant, Eggplant, Rosa Bianca Eggplant, Rosita Eggplant by Lopez Island Kitchen Gardens. Bookmark the permalink. 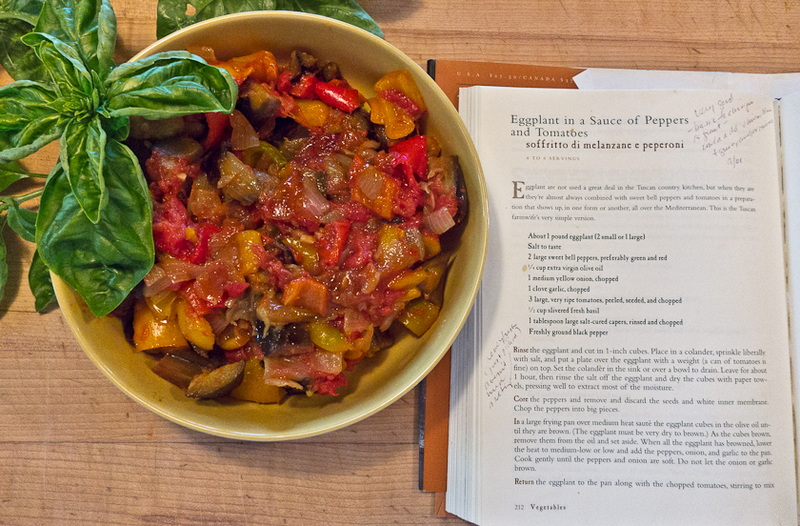 Thanks for sharing your caponata recipe! I’m going to make it tonight and put it on some polenta with some Italian sausage….yum! 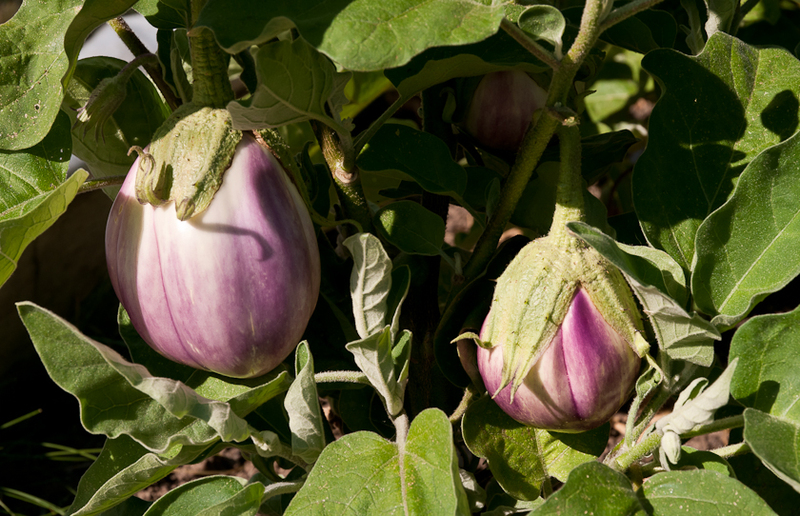 I think eggplant is one of the most beautiful plants in the veggie garden. Such unusual veggie colors. Your caponata recipe sounds very similar to a dip recipe I make each fall in bulk with a Romanian friend, although hers starts with roasting the eggplants till soft. The Romanian name sounds like zakooska – not sure on the spelling, but we use tomato paste to save oodles of time from otherwise cooking tomatoes down till thick. It also has bay rather than basil. You can’t really go wrong with tomatoes, onions, peppers & eggplant in all kinds of variations.